The Portek Logmaster Sawhorse solves the problem of staying safe when preparing firewood. It has been developed so that even inexperienced chainsaw users can feel completely safe when using a chainsaw either petrol, electric or battery. 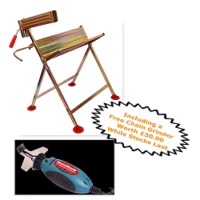 Included in the deal is a Portek 12V chain grinder (worth £30.00) which will aid in preparation to cutting up logs making the job easier on you and your machine.